And, of course, that’s our ultimate goal when you visit us. But, equally important to us is that you feel comfortable every time you come to see us — that you feel confident approaching us with your questions or concerns. We’ve all been there. We’ve all shared that same nervous feeling we get when experiencing something new. And, whether it’s your first visit — or you’ve been seeing us for a while now — there are always questions that seem to pop up. Having answers to some of those questions helps our patients feel at ease, which is why we’re provided the next several resource pages designed to take the guesswork out of what to expect from your experience with Digestive Care Center. Of course, if at any time, you can’t find the answers to your questions — or if you just don’t have time to look it up — give us a call. That’s what we’re here for! And we love hearing from our patients. Please review the extent of your insurance coverage for office visits and any procedures that you anticipate in the course of your care with Digestive Care Center. You can review our Insurance and Billing Policies here. Bring your driver’s license and your primary or secondary insurance cards. Bring a list of all your current prescription medications. After your first visit, we’ll have most of the information we’ll need for all your future visits. Please just remember to bring your current insurance cards and driver’s license with you for every single visit — that way we can note any changes. And please be sure to update us regarding any change to your address or phone number. From the Lloyd Expressway, exit on Vann Avenue and proceed South. Turn left (East) on Washington Avenue. 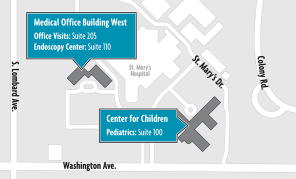 Turn left into the St. Mary’s Medical Center main entrance. Proceed down St. Mary’s Drive, turning left at the T-intersection. The Medical Office Buildings will be just ahead on the left, with parking in front and the entrance under the orange canopy. The easiest way to refill a prescription is to contact your pharmacy directly. In most cases the process is automated and only requires the information contained on the label of your prescription. Even if you have no more refills, your pharmacy can contact our office to renew your prescription. If additional information is needed, someone from our office will contact you to discuss your need for additional medication or to arrange an office visit to ensure proper treatment. You can also request a refill by contacting our office at 812.477.6103. When calling our office, you have two options: you can use our convenient, automated refill line or you can leave a message regarding your refill request. Refill requests received after 12 noon will be processed the next business day. Prescriptions for narcotics and pain medications will be filled only during office hours — we cannot confirm refills after hours or on weekends. If you have a medical emergency, please seek emergency assistance by dialing 9-1-1. For non-emergencies, you can call our 24-hour access line at 266.CURE for a next-day appointment.